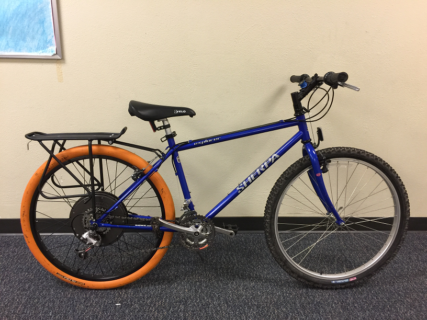 In honor of National Robotics Week, here is a shareworthy recap from the Fall 2017 eBike STEM high school class, written by student Karthik Sreedhar. The class was a partnership between the Lake Monsters Robotics program and the Community Cycling Center, made possible thanks to Chuck Brabenac and the Intel Encore Fellowship program. My interest in robotics came from my fascination with all sorts of vehicles and how they work. Whether they are bikes, cars, trucks or airplanes, I have always been fascinated with the fact that through engineering, these massive machines have the ability to move at such high speeds. Robotics provided me with an opportunity to study and create a similar vehicle–robots. I was amazed that, as a group of high school students, a robotics team was able to create a working robot from scratch that could perform all sorts of tasks, many of which I am unsure even I could do. Through my school robotics program, Lake Monsters, I was given the opportunity to take an eBike STEM class where I learned much more about moving vehicles than I had ever imagined before. 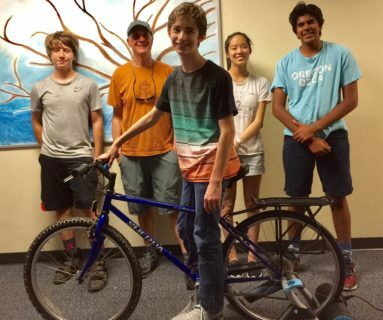 My favorite aspect of the eBike STEM class was that, by the end of the course, a few of my robotics teammates and I had created a rideable powered vehicle. With guidance from our instructor, the transformation of a regular bike into an eBike seemed easy. Each day, the lectures helped me understand more about how the mechanics behind any motor, battery, or interface worked. When learning how an eBike motor worked, I simultaneously deepened my understanding of the motors used on the robots that we constructed. Similarly, when we explored the inside of an eBike battery in class, I was able to imagine how the insides of other batteries might look and work. The course inspired me to learn even more about eBikes and explore methods to possibly even improve them. Before the course, I had never ridden an eBike. Riding the one that I had constructed felt extremely good because I could say that I was riding something that I had made. The robots that I help create with my team are great to watch when competing, but it was a different feeling to actually ride and use something that I had made. Aside from the feeling of riding something I had created, just riding an eBike was extremely fascinating to me. The eBike was able to easily climb to high speeds with relatively little effort from me, whereas when I ride a regular bike, I have to work harder to even get it to start moving. Although I ride in cars every day, riding a bike at a high speed was a much different experience since I saw how powerful motors could be.